What were you doing on 7 November 1975? Some of you hadn't been born yet. Others may have been watching the Wombles on kids TV. Others wearing flares and listening to Glam Rock. Others may have been celebrating Angolan independence. You probably weren't in the Spanish Colony of Western Sahara listening anxiously to the news that thousands of Moroccans were gathering to march into your country and claim it for the king of Morocco. On 6th November he had called for a Green March to be organised and although the thousands of moroccans who answered his call never crossed the border in significant numbers it must have been a frightening prospect. Shortly after Moroccan military forces invaded and the Spanish colonialists offered no resistance. General Franco's Government had done a secret deal - in return for a slice of the profits from the phosphate mines he gave the colony (that was not his to give) to Morocco and Mauritania. The Polisario Front, the liberation movement that had been set up to fight the Spanish colonialists, fought bravely against moroccan forces and provided protection for the Saharawi as they fled into exile in the desert under bombing from the air. The international community stood by and did nothing. And they have done so for the following 40 years. The Saharawi still wait to express their inalienable right for self determination. 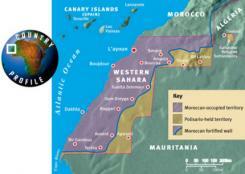 Moroccan authorities still brutally repress any questioning of their illegal occupation inside Western Sahara. Over 150,000 Saharawi refugees still live in camps in the desert. Camps that have recently been devastated by torrential rain and flash flooding. On Saturday 7th November 2015 supporters of the Saharawi right to self determination will gather outside the Moroccan embassy to draw attention of the failure of the international community to act. Please join us at 49 Queens Gate, London, SW7 5NE at 2pm. We must continue to show that this injustice is not forgotten. Email coordinator@wsahara.org.uk to confirm your attendance.